Friday was a lot of fun! Look at all the new middle school kids and their families! My first week was perfect! Yes, the air conditioning is fixed and I can wear cardigans! Because of generous friends and two used book companies, I am acquiring quite a bit of Elizabeth Goudge. I must admit that my first taste of EG writing did not "jive" with my quick reading brain. I kept trying. Now, I really believe that reading Elizabeth Goudge has made me a better reader. The Little White Horse is delightful. I know many of you know that. The White Witch was also a thoroughly enjoyable read. There are treasures in this kind of writing. I could say more, more, more. I'll stop. This is just my kind of knitting book - stories. Patterns, too. The grands like my new watch. I bought it at the quilt shop. It's very gaudy. Sorry about the bad photos! I was in the car with Bill. Today we went to see these silly geese. Aria was napping. We played Mother May I? We played Simon Says. Cadence said, "Can you do a handstand?" My response, "Nope. Too fat." I might try though, so I can surprise her next time. 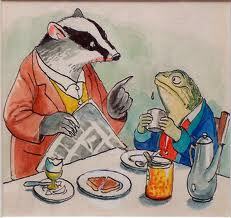 Just so you know, another Wind in the Willows blog party is brewing. I think you'll like it. How can you not like Mr. Badger in his sassy coat? And I know it's kind of dumb, but I like to take pictures of the flowers at the grocery store. Aren't they lovely? I didn't buy any, but I'd like to try to make some posies. Hi Cutie! This bug was in the bathtub about a year ago. I think he looks peppy and because I don't feel very peppy, I like looking at him! Oh, two days of school and I am yawning and having mid-day wimp outs. I'm not in the swing of things quite yet. But guess what? The sixth graders are FANTASTIC! They are so cute, so good, and well, I love them already! We have had a lot of "sixth grade start up" things to do, but next week we'll start our own stuff. They really are charming. They laugh at my jokes and they get right to work when I ask them to. Whew! I'm loving it! My classroom is as hot as the surface of the sun. This contributes to the wilting. I have to find time to fill up my water bottle. I HAVE to sit on the purple stool RIGHT by the fan. They are trying to fix the air conditioning. Pray. I am feeling ultra-cheerful about my move to sixth grade! We have a big picnic for lunch on Friday. The school really welcomes them and other than big-time difficulties with their locker combinations, they are feeling calmer every day. It IS still summer. We're feeling it here. It's HOT outside. Teachers are wearing sleeveless tops and sandals. I'm not the only one roasting. I'm looking forward to the weekend, so I can get my bearings (and a nap!) I want to do some more planning and creating and possibly clean this neglected little house. Let's have a little cup of tea, soak up the last of the summer sun, and thank GOD for children. Three of my grands are going to Disneyland this weekend. Lucky them! I have some books to share with you! Other stuff, too. Thank you for checking on me. You're nice. It's almost the first day of school and after a hot and sweaty afternoon of set up (Bill helped! Whew!) the classroom is ready for the sixth graders! Can you see what is on the back of my chair? I know my desk looks like a parade float but I like it soft! Do you want to sit in the reading chair? Here's all the wordy stuff! LOVE! Here is where the paraprofessional will sit. I'm so glad she'll join me every day, first period! Last night I sprayed this old dog-chewed stool, so I can sit down while I teach. I know, lazy. Meanwhile, back at home, look at this ambitious hollyhock! Look at the zinnias! They are bright like the colors in a crayon box. And good morning to YOU, Morning Glories! Here is a smiley face for you! Thank you for your good wishes and prayers for the first week of school. I found a very real prayer in my Elizabeth Goudge A Diary of Prayer, written by a nun. I'll leave it for you. growing older, and will some day be old. habit of thinking that I must say something on every subject and on every occasion. Keep my mind from the recital of endless details - give me wings to come to the point. I ask for grace enough to listen to the tales of others' pains. Help me to endure them with patience. But seal my lips on my own aches and pains - they are increasing, and my love of rehearsing them is becoming sweeter as the years go by. Keep me reasonably sweet. I do not want to be a saint - some of them are so hard to live with - but a sour old woman is one of the crowning works of the devil. Make me thoughtful - but not moody; helpful, but not bossy. With my vast store of wisdom it seems a pity not to use it all, but Thou knowest Lord, that I want a few friends at the end. I'm so glad you stopped by! May your week roll on the high seas of joy! Well, hello! I've been working at school and had oodles of meetings. I'm not in "school shape" yet! I'm pooped when I arrive at home. I must add that so far, being at school has been FUN! The teachers are so nice and the meetings haven't been boring or frustrating. Hooray! I'll take some pictures of my classroom and show you what the first day of school looks like in Pom Pom's room. For now, let's look at a bird's house. Or let's go to the quilting store and look at gorgeous colorways of fresh smelling cloth! When I went to the quilt shop, I didn't buy anything. I don't have the quilting bug. I made patchwork quilts when I was a teenager, but I don't want to make quilts now. Weird, huh? I want to make skirts, curtains, wacky pillowcases, and bunting. I still like to look at all the colors, the order, the books. Do you? I made the curtain below for Jenny's first house. It might still be there! Don't you love polka dots? What's outside your window? What do you WISH you could see outside that window? I wish I could see the sea. Notice the red theme? This time of year, I like red stuff. Red is smart. I have been meaning to show you this assignment my arty/blog buddy/art exchange friend Lisa sent me. She suggested I color the images she drew from pictures on my blog. It was fun! We're both starting school now, so we'll slow down the frequency of our snail mail missives, but I have enjoyed getting to know her better and looking at her wonderful art! The link to her blog is on my sidebar (Pen and Ink and Maybe Some Paint). I am going to try to draw more at school and encourage the students to draw more, too. I'll let you know how it goes. Here's the dress I'm wearing on the first day of school. Doesn't this teacher look serious? 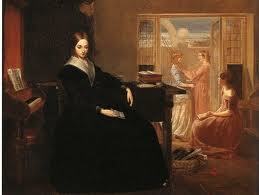 This painting is called "The Governess" and I like it. Do you? I feel slightly overwhelmed when I list the "yet to do" tasks. I AM excited to meet my students and to get to know them quickly. Thank you for stopping by, by the way! Preparations were made early Saturday morning with warm thoughts of little sprites soon to fill the garden. Tiny cupcakes, moist and sweet, awaited the birthday boy and his harem. Grab your personal picnic lunch. Can you find your name? Wear your bright swimsuit and you are guaranteed to receive multiple hugs and kisses. Yes, you are a member of a lovely little club. Toddle around in your puffy skirt, brave little fairy! Or sit a while with your mommy. Seven little wonders, our own sweet offspring, good food, a long happy day. Perfect. I bought my school shoes. I ordered blue first, but the right shoe was very tight. I thought it was MY foot, so I looked at them for a while. I kept trying them on. Finally, Kelli tried them on and confirmed that one was just right, one VERY tight. Back they went to the local store and because they didn't have blue in my size . . . GREEN. I love green this year so I'm happy to wear parrot colored shoes instead. Last night, Bill and Jeff went to the ape movie. I stayed home to sew pockets. In the second edition of Mollie Makes, there are pocket patterns. I love the pockets! The skirt I am sewing is already too small. I'll finish it and save it for leaner days! When Jeff saw the skirt, his eyebrows rose. "It looks a bit Pom Pom-ish?" 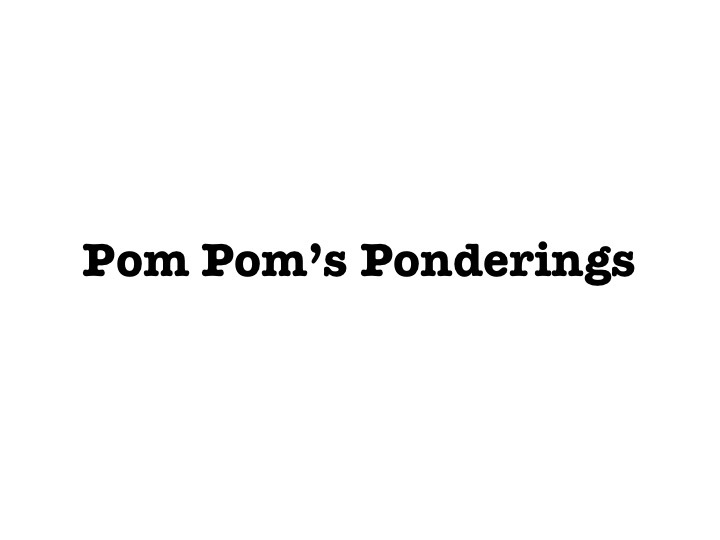 His reply, "Yes, VERY Pom Pom-ish." Oh well, the pockets are a bit clownish and I do gravitate toward clown apparel. Yesterday, whilst on my walk (yes, I waited until the last week before school starts to begin my long walks) I walked by one of my favorite houses. Isn't it bold to build a log cabin in the middle of a bunch of fancy-shmancy homes? I love this cozy abode. Really, it's in one of the expensive neighborhoods and it's such a breath of fresh air. Susan Branch did a post on dishtowels and she said something very interesting. She said, "so the minute I figured out what things made me happiest . . . " I truly believe that God is pleased when we find our own beauty. Whether it is clowny pockets, a big bowl of gummy worms, a stack of favorite books, baskets overflowing with yarn, cupcakes, or green shoes, He isn't absent from the details. What makes you happiest? In a small detail-y sense, I mean. One day, quite some time ago, I created a lovely little lunch for myself. I can't find this scone mix anymore and I'm taking a small break from baked goods, but isn't this happy? This is a breakfast I had in Sydney, down by the harbor, over a year ago when we were blessed to visit Australia. Oh, it was delicious. Do you love all that whipped cream? I am off to visit my classroom this morning and survey all the unpacking I must do. After that, I am going over to the Princess House and taking Birdie to our house so Kelli can nap while Miss Bug and Millie Rose nap. Then Birdie will have dinner with us, play, and we'll go back to her house for a slumber party. We were going to slumber here but Jeff has two house guests arriving tonight. So, I shall sleep in the trundle bed and Bill says I am like Granny Wendy and I should make a night time fort to read stories in before we sleep. We'll see how old Granny Wendy's joints feel when bedtime rolls around. I'm sad about going back to school. I'm sure when the kids are in the classroom, with their nervous little faces and their new school supplies, I'll feel joyful. Right now I want to sit in a teepee and knit or read. I think I will feel better if I make Finn's birthday cupcakes, don't you?